Hello there. A quick post I’ve had on hold for a couple of months. There’s been time but somehow it just kept leading away from here to the printed page (check out the recommended reads at the side...). 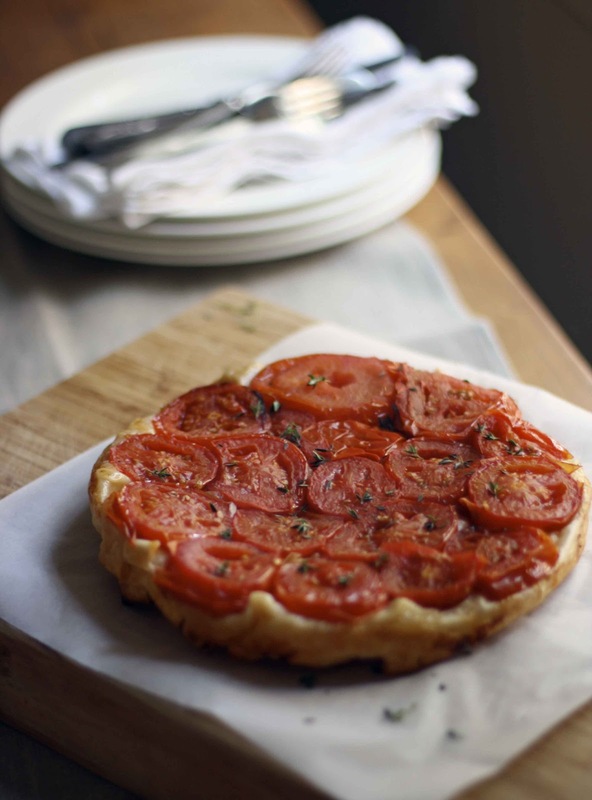 So so late, but worth trying this simple tart if tomatoes are in season in your neck of the woods. But first the salad as Blogger is stuffing with the settings and I’m done fighting it! Cook asparagus in boiling salted water for 1-2 minutes. Drain and transfer to a bowl. 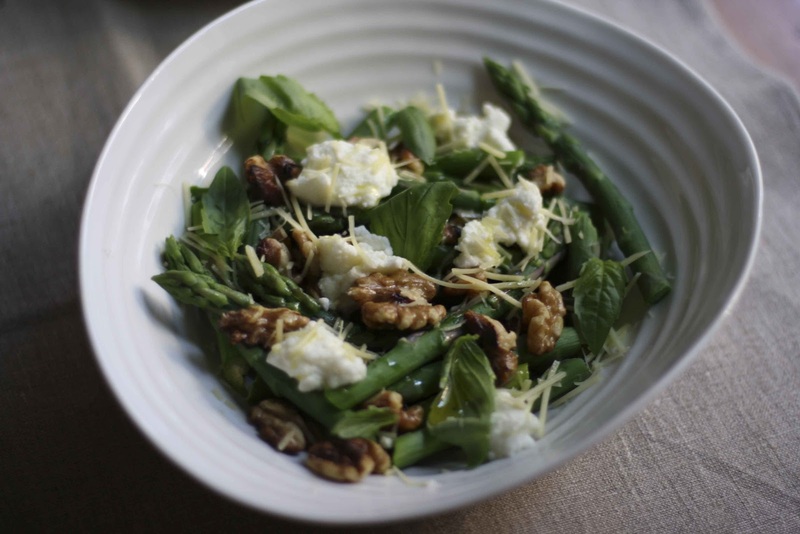 Toast the walnuts and then add to the asparagus. Add a lug of olive oil, and season to taste. Transfer to your serving platter/bowl and scatter with parmesan, ricotta and basil leaves. Drizzle with lemon juice and serve immediately. If you want this to look picture perfect, the original recipe used firm ricotta, crumbled, and shaved parmesan, of which I had neither on the Saturday afternoon I threw it together from the leftovers in my fridge. Preheat oven to 220C. Line 2 oven trays with baking paper. Lay tomato slices flat on trays. Bake for 30-35 minutes, until slightly dry. Allow to cool on trays. Heat butter in a frying pan over a medium heat. Cook onion in the pan for 6-8 minutes, until softened but not coloured. Sprinkle onions with sugar and cook, stirring for 2 minutes until onions are caramelised. Stir in white balsamic vinegar until combined. Remove from heat and turn off element. Using a 20cm springform cake tin, layer the bottom with tomato slices until completely covered (the side of the tomato that was face up during baking should now be face down on the bottom). Season with salt and pepper. Sprinkle onion mixture over the tomatoes. 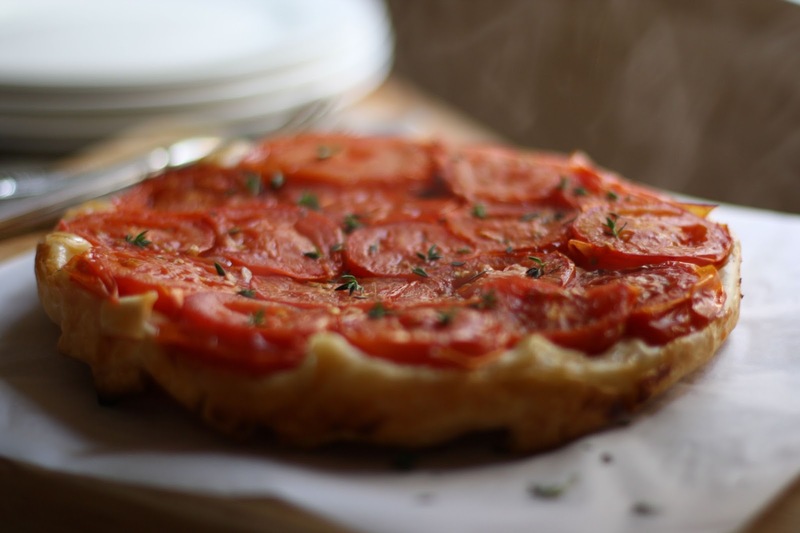 Place both sheets of puff pastry directly on top of the tomato and onion and fold in the corners. Bake for 25-30 minutes, until puffed and golden. Stand for 5 minutes. Remove springform part of the cake tin. Place a plate on top and invert. Scatter thyme leaves on top. Cut into wedges and serve.